Tubular steel construction, overall sizes 210cm long x 110cm wide at the base,50cm wide at the top and 190cm high. 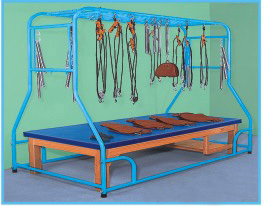 All welded steel rod mesh at the top for complete suspension with slings and ropes, Mesh facilitate suspension at any desired point in relation to the patient and as required in each individual case. Comes complete with Suspension Gear comprising 7 canvas slings (4 limb, 2 trunk & 1 head), 4 single hook ropes, 2 double pulley & 2 single pulley ropes with necessary hooks and cleats,8 graduated springs of different tension, 4 'S' hooks & 2 ankle straps. Spray enamel finish.